Student fees protests: Does rioting change anything? 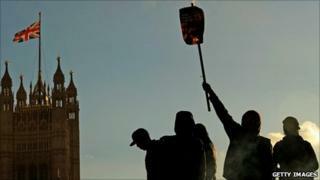 Angry protests against tuition fee rises in England have been marked by rioting. Like them or not, do such tactics prove effective? It was a disturbing, unforgettable tableau, a sight that may come to define an era of unrest: Parliament Square, in the aftermath of serious civil disorder, scattered with charred debris, mangled barriers and broken glass. The roll-call of injuries, the cost of the damage inflicted on central London's infrastructure - all prompted swift condemnation from the home secretary and the National Union of Students alike. But if drawing attention to their cause was the protesters' aim, the wreckage proved effective. Every newspaper front page and TV bulletin used images of the chaos to illustrate the anger unleashed among students by the government's plans. Whether or not you think it's morally right, rioting played a part in bringing about the right to vote and in the formation of the welfare state. By contrast, we had a million people [peacefully] taking to the streets to stop the war - not only did Tony Blair ignore it, he won the next general election. That's not to say that rioting always works or that it's always in support of a noble cause - far from it. And in the case of the poll tax, you could argue that the fact there was such strong opposition from across society was much more important than one riot. This disturbance, as with any other, is the focus for claim and counter-claim about whether police or demonstrators instigated the violence, and whether a hard-core of militant protesters or the Met's "kettling" tactics were responsible for escalating tensions. Chief Constable Paul Stephenson has blamed dedicated "thugs" in the crowd for instigating trouble while supporters of the protesters complain of alleged police heavy-handedness. Putting aside the rights and wrongs of this particular case, the British public insist overwhelmingly that they are repulsed by rioting. According to a recent poll by YouGov (PDF), 75% of respondents agreed there were "no instances in which violent protest is acceptable in a democracy" - although some 19% believed there were circumstances in which it could be justified. But few would approve of hurling a fire extinguisher from the roof of a tall building. Yet in between such behaviour and peaceful protest lie direct action and civil disobedience which target property, rather than people. This lineage stretches back to the Suffragettes, who smashed windows, set fire to letterboxes, chained themselves to railings and defaced paintings in the cause of women's right to vote - and, ultimately, prevailed. The battles for the right to vote; bitter labour disputes during the miners' strike at Orgreave and the News International dispute at Wapping; and landmark disturbances in London's Notting Hill and Brixton, Liverpool's Toxteth and West Yorkshire's Bradford all left their mark on British history. And the UK is hardly immune. Economic instability has led to a recent spate of unrest around the world, with Italy the latest country to witness violence on the streets following a controversial government vote of confidence this week. One former rioter who downplays their significance, however, is Mail on Sunday columnist Peter Hitchens. Now best known for his trenchant conservative views, in 1968 Hitchens earned his political spurs as a left-wing radical at an anti-Vietnam war demonstration by hurling mud at the police. Today, however, he insists that in a free country, the authorities have a duty not to be swayed by the actions of the mob. "It's tremendously exhilarating," he admits. "Riots are fun. The self-importance, the adrenaline rush of slight, but not serious, danger. "But it can't be justified in free countries where there are legitimate means of expression. Any government that has any fortitude at all has to show it's not influenced by that stuff." The Suffragettes, of course, insisted that they were using direct action because they were denied the vote. Today's student demonstrators cannot make such a claim - at least once they reach 18. Additionally, advocates of peaceful protest say violence of any kind undermines the moral authority of the protesters' cause. However, New Statesman columnist Laurie Penny, who reported on the Parliament Square and Millbank demonstrations from the front line, says this assumption that British democracy guarantees everyone a voice is undermined by both the ineffectiveness of the Iraq demo and the sense of betrayal felt by students who voted Liberal Democrat because of the party's pledge to vote against fee increases. She condemns the throwing of the fire extinguisher and those who set out to attack police officers. But she insists the majority of those who took part in civil disobedience had no other way to articulate their frustration. "Peaceful protest is utterly ignored in this country," she says. "What the government wants is for people to be docile." An act like smashing windows of tax avoiders, she argues, is "not a cause of social breakdown, it's a symptom of social breakdown". The view from the other side of the police line is, of course, very different. Brian Paddick, a former Deputy Assistant Commissioner with the Metropolitan police and one-time Lib Dem candidate for London Mayor, gained his formative experience of civil disorder as a young sergeant during the 1981 Brixton riots. Recalling how he and his officers were attacked with paving slabs, bricks and lumps of concrete, Mr Paddick cannot condone the violence. But he did understand locals' sense of voicelessness and anger at the heavy use of stop and search targeted at ethnic minorities in the area, and this heavily influenced his own community-led approach when he became Brixton's commander a decade after the violence. "In 1981 nobody would listen," he says. "No media would cover the oppression that, particularly, young black men were suffering at the hands of the police at the time. "The uprising in Brixton was understandable if not legitimate. You can't say that about the violence on the streets of London in the past few weeks." The only certainty is that the threat of disorder will persist as long as it captures our collective attention.